As an entertainer and businessman with many layers, CeeLo Green cannot be summed up in just one title. He is a five-time Grammy Award Winning singer-songwriter-producer, television personality, actor, entrepreneur, pop culture & fashion icon. 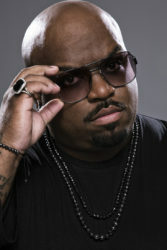 In 2011, CeeLo received five Grammy nominations for his worldwide hit “Forget You” (aka “F—k You”), winning the category for “Best Urban/Alternative Performance”. The single is certified Gold in the United States and Denmark and achieved platinum status in Canada, New Zealand, and the UK; and multi-platinum status in Australia. Currently, CeeLo has just released his new solo album “Heart Blanche”, in Nov, 2015 and features singles “Robin Williams”; “Sign of the Times”; “Music To My Soul” and “Work”. He also reunited with his original rap group Goodie Mob, after a 15 year hiatus, to release a new album entitled “Age Against the Machine” in August 2013. Additionally, in October 2012, CeeLo released a Christmas album “CeeLo’s Magic Moment”, which featured the single “All I Need is Love” featuring The Muppets, and the album was nominated for a 2014 Grammy. He’s made memorable appearances on Saturday Night Live (2011), Oprah (2011), presented at the Billboard Music Awards (2013), ESPYs (2011), and Kids’ Choice Awards (2012) as well as making remarkable performances at the 2012 Super Bowl with Madonna, The Grammy Awards with the Muppets (2011), Brit Awards (2011), Billboard Music Awards (2011/2012), Soul Train Awards (2011), BET Awards (2011), and hit such mainstream status that even Gwyneth Paltrow covered “Forget You” on Glee (2011). CeeLo has also landed the cover of Fast Company’s 2012 “Most Creative People in Business” issue, Rolling Stone magazine, Delta Sky, Wax Poetics magazine, as well as Jet magazine. In addition to his success as a recording artist, CeeLo Green completed four seasons as a coach on NBC’s hit show The Voice alongside Christina Aguilera, Adam Levine and Blake Shelton. With a strong passion and natural talent for acting, CeeLo has big plans to further his career as an actor and film/TV producer and as a result has developed his own production company Emerald Productions in partnership with Primary Wave Music (CeeLo’s management company). The first project on Emerald is a reality-based show documenting the everyday life and happenings of CeeLo and the Goodie Mob called “The Good Life,” which premiered June 23, 2014 on TBS. He has also made guest-appearances on NBC’s popular show Parenthood (2011), FOX’s American Dad (2011), Nickelodeon’s How To Rock (2012), Anger Management (2013) and also hosted his own talk show “CeeLo Green Talking to Strangers” on FUSE TV. On top of his television work, CeeLo Green is transitioning his career into acting and has made an impact on the film industry starring in Sparkle (August 2012), which was Whitney Houston’s last film. Additionally, He is the voice of “Murray the Mummy” in the Sony animated film Hotel Transylvania (September 2012) along with Adam Sandler, Selena Gomez, Andy Samberg. CeeLo also starred in the John Carney film BEGIN AGAIN along with Keira Knightley, Mark Ruffalo and Catherine Keener. In February 2013, CeeLo Green debuted and completed the first run of his Las Vegas residency “CeeLo Green is Loberace” at Planet Hollywood, which ran through April 2013. More of a spectacle than a show, CeeLo’s residency took guests on a ride through the colorful decades of music and featured dozens of dancers, who had moves that made you blush. Visually, the production combined CeeLo’s flamboyant sense of style & over-the-top creativity, magnified and intensified, with his soulful voice covering some of his favorite music, as well as original songs. CeeLo truly approaches the industry as a businessman. He was appointed Chief Creative Officer of Primary Wave Music, the management company CeeLo signed with in 2010 and is one of the largest independent music marketing, talent management, and music publishing companies in the US. He remixed the iconic Meow Mix Jingle with his cat Purrfect; became the face of ad campaigns such as 7UP and Las Vegas Tourism; and also released his first book “Everybody’s Brother” in September 2013, which told the story of his colorful life to date. CeeLo Green first came onto the music scene as a member of the southern hip-hop group Goodie Mob along with Big Gipp, T-Mo and Khujo. Goodie Mob released their 1st album “Soul Food” in 1995, pioneering them to the top of the emerging Southern rap scene. The Southern Hip Hop group then released two more albums “Still Standing” (1998), and “World Party” (1999). 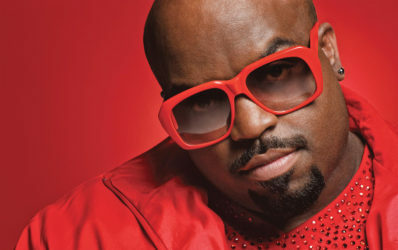 After CeeLo’s success with Goodie Mob, he reinvented himself and formed Gnarls Barkley with deejay-producer Danger Mouse to release the 2006 worldwide hit “Crazy”, which reached #1 in various singles charts worldwide. In the US, “Crazy” reached #2 on the Billboard Hot 100. Following Gnarls Barkley, Green put his time back into his solo career as CeeLo Green and released the 2010 album “The Lady Killer”, which featured his hit single “Forget You”. On a personal note, CeeLo Green grew up in Atlanta, GA. Both of his parents were ordained ministers and he started his music career in church. His father died when he was just two years old and his mother, Sheila J. Callaway, a volunteer firefighter, was in a fatal car accident and died when he was 18. His mother and grandmother were both very involved in various philanthropic efforts and to continue his family legacy, CeeLo and his sister Shedonna launched GreenHouse Foundation in August 2012, a non-profit organization with a mission to help make “green education” easier and accessible to students in underserved school districts.show, CeeLo’s residency took guests on a ride through the colorful decades of music and featured dozens of dancers, who had moves that made you blush. Visually, the production combined CeeLo’s flamboyant sense of style & over-the-top creativity, magnified and intensified, with his soulful voice covering some of his favorite music, as well as original songs.